If you’re interested in seeing the tutorial, you can read the one I did here on watercolor brush pens! Happy Spring and Happy One Year to Hopscotch Mom!!! Doesn’t feel quite like spring here in New York City today, but hopefully this happy colorful spring painting will bring some Spring into your day! –> Scroll all the way down if you want to get straight to the GIVEAWAY!! This past year has been a great experience connecting with not just other moms, parents and guardians; I’ve gotten to meet other educators that share similar philosophies with mine in relations to how we teach children; I’ve come across food bloggers who have a similar style of sharing simple home cooked food recipes like mine; I found myself trying to help make my family, a greener family and had the pleasure of working with many like minded individuals, who also strive to make the planet a healthier one by creating things that are better for it. This year has been such an inspiring one. I changed my tagline from sharing “Tidbits of all things parent and child related” to “Tidbits of all things family, child and education related.” I realize the topics I talk about include a lot more than just parent and child related things and educating/sharing with others seem to be infused with everything I share! I’m happy to say I will be adding HOPSCOTCH Teach where I will share more things that are education related. I will also be adding HOPSCOTCH Eats Out where I share restaurant reviews and/or experiences. As you already may have guessed, I am pretty in love with planning meaningful parties, so if you have a party coming up and would love feedback on how to make it more “eco-friendly” (especially when it comes to party favor ideas) or meaningful (for the celebrant), please also reach out and I may feature your party theme on my page if selected! And if you want to read a more thorough reflection of my One Year of Hopscotch Mom, you can read it here. Looking forward to sharing and connecting with many more of you! 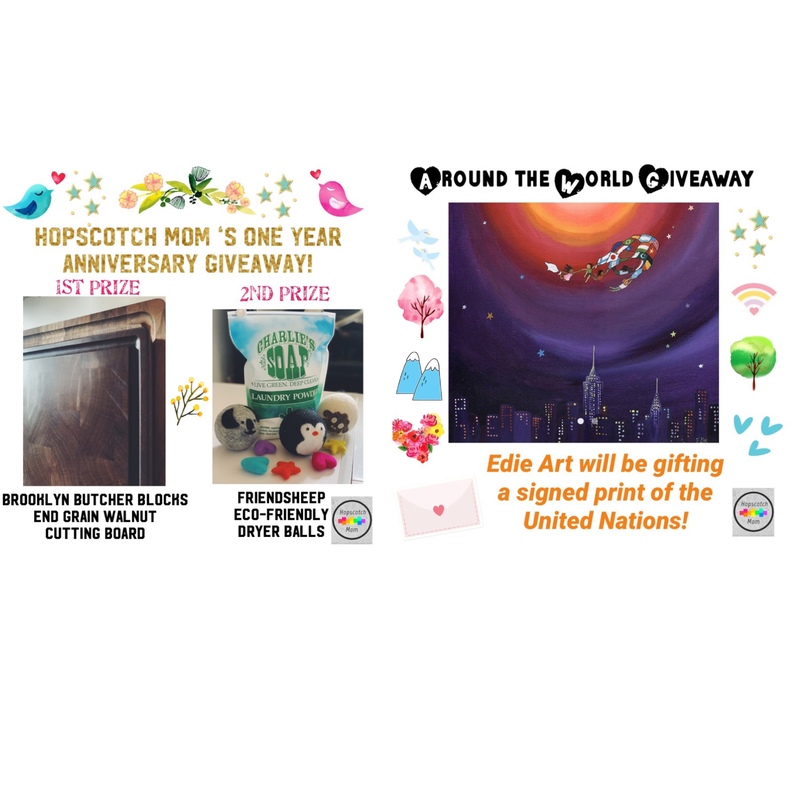 Hop over onto my Facebook or Instagram Page and Join the Giveaways! There will be 3 prizes gifted to 3 separate winners!!! Ready, set and GO!! This giveaway is for anyone who would appreciate and make use of these prizes! 1- Please head over to my INSTAGRAM and/or Facebook page for HOPSCOTCH Mom. 2- Simply LIKE my post on either page for the giveaway. 3- TAG 2 friends who would like to win these items as much as you! 4- Each pair of friends (2 friends) you tag should be in a different comment to be a separate entry. 1- Please head over to my INSTAGRAM and/or page for HOPSCOTCH Mom. 3- TAG 2 friends who would be able to make use of the items of the giveaway. ***ONE winner will be chosen at a time randomly! There will be a winner for the 1st Prize and 2nd Prize for US Entrants. 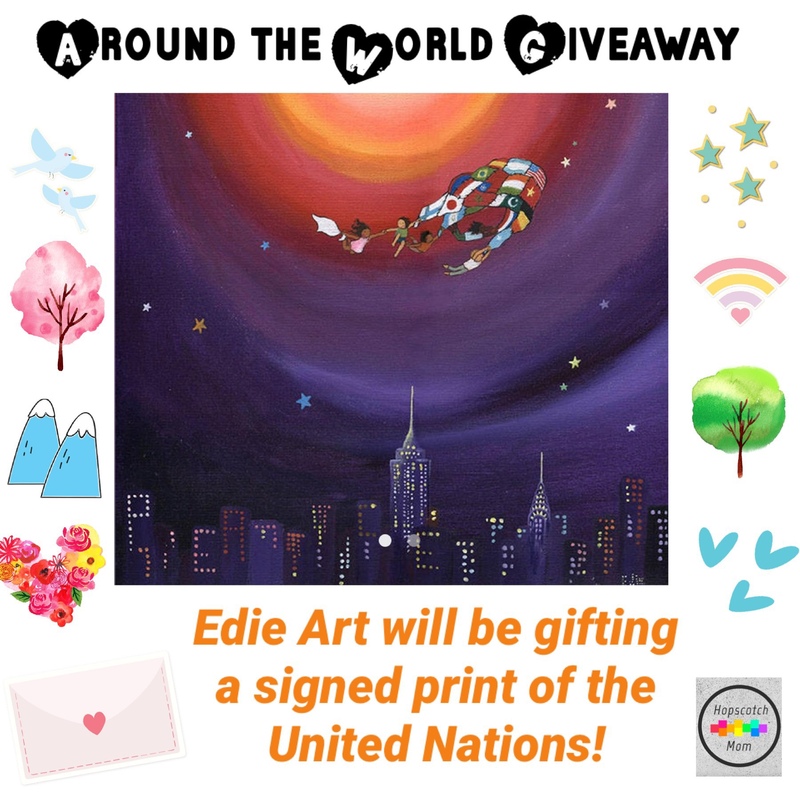 There will be 1 winner for the Around the World Tier of the Giveaway for anyone around the world. The winners have 48 hours to contact me to claim it. Profiles must be made public for the time of the giveaway. Contest begins at 12:00pm Eastern Time on Wednesday , March 20, 2019 and ends on Wednesday, March 27, 2019 at 12:00pm Eastern Time (the “Contest Period”). 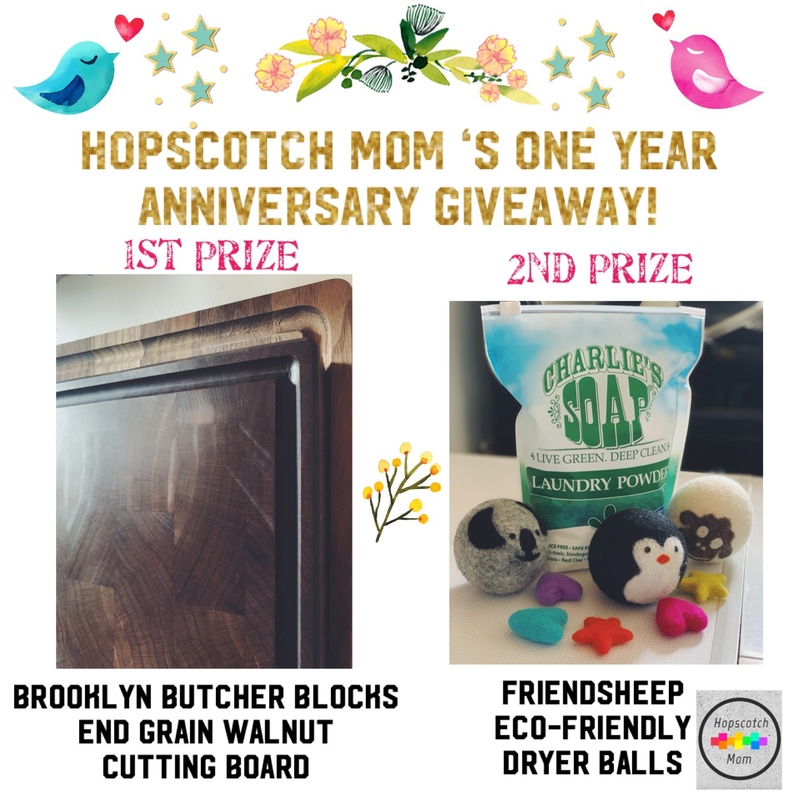 Next Next post: Hopscotch Mom One Year Anniversary Giveaway WINNERS!! !